consecutive gold in the quadrennial event here today. Hockey in front a packed house at the Major Dhyan Chand National Stadium. With this win, Australia reigned supreme winning in all the four editions of Hockey competitions at the Games since the sport made its debut in Kuala Lumpur 1998. The D2010 Gold also gave the Kookaburras a rare feat as they became the only men’s hockey team to have won the World Cup, Champions Trophy and the Commonwealth Games in a year. Barring the crushing defeat, India can take heart from the fact that in Delhi they have managed to win their maiden Commonwealth Games medal - a silver and bettered their fifth place finish in Melbourne 2006. 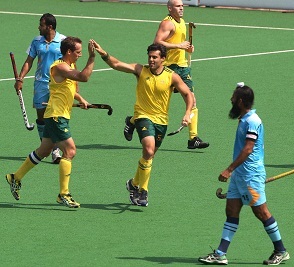 In the final, Australia showed their class and taught India a Hockey lesson, pumping in four goals in each half. Contrary to the humiliating scoreline, India gave Australia a run for their money in the opening 15 minutes but faded away failing to match the power of their rivals. "Thank You All For Your Kind Support" read the poster which Mahadik held aloft as he took a lap of honour along with his teammates at the end of the final. His gesture was received very well by the spectators as they gave a standing ovation despite an embarrassing defeat in the finals. "It was a decision by the team. The crowd has been tremendous and been right behind us during the tournament. This is our way of acknowledging our fans for the great support that we have got," coach Jose Brasa stated. The triumphant Australian Hockey teams turned out to be generous winners as they decided to donated their gear to an Indian charity. Salaam Bombay Foundation, an NGO that runs a Hockey academy for underpriviliged girls have recieved the gear used in the Commonwealth Games. "Having recognised the need for supporting Salaam Bombay Foundation's initiative, Hockey Australia has decided to voluntarily donate the hockey kits for the benefit of the children that they work with," Mark Anderson, CEO, Hockey Australia said. "We believe that this will go a long way in providing these children with a lifetime opportunity to be a part of a tremendous sporting experience," he said. Anderson said the initiative was not an usual one. "We do not usualy give away our gear but we were impressed by the foundation and their objective and wanted to support their endavour." he said. Hockey India has also supported this initiative and joined Hockey Australia in making an appeal to all the participating teams to follow suit.